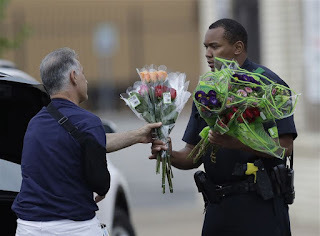 If you were to destroy the belief in immortality in mankind, not only love but every living force on which the continuation of all life in the world depended, would dry up at once. Moreover, there would be nothing immoral then, everything would be permitted. Fyodor Dostoevsky, The Brothers Karamazov, 1880, p. I, 2, 6 (p. 69 in the 1990 translation). Should this statement give the “New Atheists” pause? Do they have a good philosophical answer to Dostoevsky’s challenge? 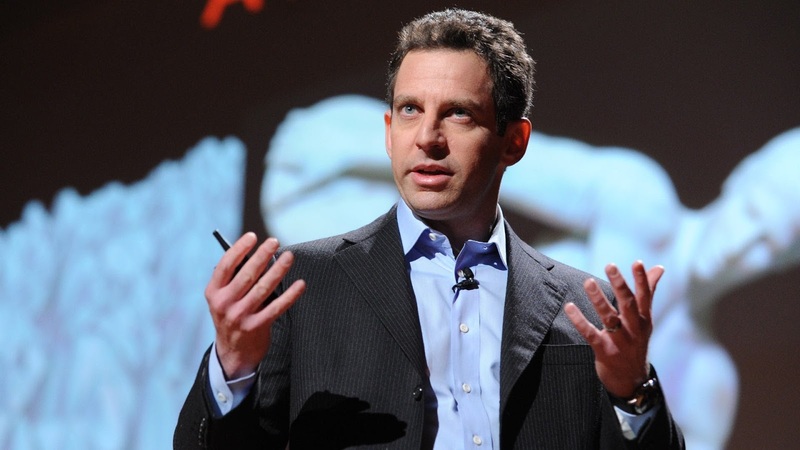 Sam Harris believes that he can navigate through these stormy seas by pointing to increases in happiness and decreases in suffering. He states that “questions of right and wrong are really questions about the happiness and suffering of sentient creatures.” Thus, for Harris, the foundation of morality comes down to caring for the well-being of all sentient creatures. This has led Harris, and other atheists similar to him, to a Vegan-like diet because they believe that it is wrong to cause pain and death to animals. Harris calls the source of this basic moral knowledge “moral intuition.” He also suggests that being moral tends to contribute to one’s happiness. One must concede that there is a degree of logic to the Harris argument, even as it seems to argue in circles. The degree to which a creature is sentient is difficult to determine. Is a lobster more or less sentient than a chicken, sheep, or steer? What about studies that suggest plants have feelings? Does a tree “know” that it is being felled in the forest? Does it care? As the “Arrogant Worms” sing in one of their comedic songs, is carrot juice murder? Comedic references aside, what about sentience and consciousness in general? The same atheists who argue that we should care about conscious animals, will also argue that consciousness is nothing more than chemical processes in a brain, consisting of atoms that came together through many processes, stemming from the Big Bang of the universe’s beginning. In the philosophy of the New Atheists, are the chemical processes in the brain-stem of a sheep more important than the chemical processes in the circulation system of a turnip, or an ancient White Oak tree, or a human child who is not even aware she is alive? Does Harris ever question his own happiness? Why should he feel happy at not eating a lobster; or happy at giving money to a street survivor in New York; or unhappy with himself for not giving money to a person on a New York street? How is his happiness affected by whether I walk past or contribute to that same street person in New York? Dostoevsky makes the stronger case and ultimately speaks the greater truth. It is easier to see Dostoevsky’s words coming to fruition than the hopeful, but ultimately, groundless words of Sam Harris. I can appreciate that Sam Harris is an intelligent person and is trying hard to create a plausible system, but the system falls shorts and ends in the circle within which it began. Without a foundation in a moral Creator, morality based on our emotions will never triumph and the best laid plans of Harris and others will most often go very far astray. A team of over 1000 people from 17 countries is currently working on the James Webb Space Telescope. Three space agencies are collaborating on this major undertaking, including NASA (National Aeronautics and Space Administration in the United States), CSA (Canadian Space Agency), and ESA (European Space Agency). 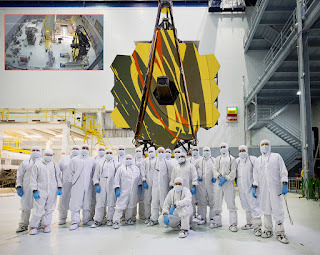 Many believe this will be the next great space telescope of our time and they have high hopes that the James Webb will further elucidate the conditions of the early universe because of its ability to detect ancient radiation released from events in the distant past. Previously, the Hubble Space Telescope has been (and still is) the main work-horse of planetary discovery and space imaging. Launched over 26 years ago in 1990, Hubble has served well despite initial problems with its mirror (which were later corrected by astronauts who worked on Hubble while in orbit). 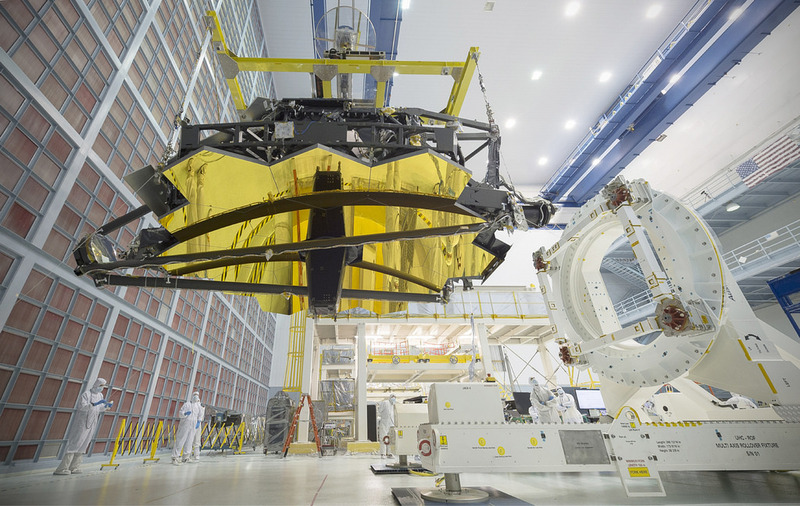 The new James Webb telescope will benefit from the hard-learned lessons of Hubble and will incorporate current technology which surpasses that installed on Hubble. 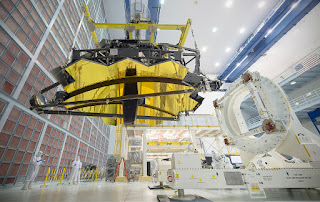 The ground glass mirror on Hubble is 2.4 metres in diameter, while the compound 6.5 metre diameter mirror of the James Webb is a gold-coated beryllium reflector. The collecting area of the Hubble is 4.5 m2 while the James Webb will have a collecting area of 25 m2. Hubble has four main instruments on board, while James Webb will have five high-tech devices for viewing a wide spectra of radiation including UV, Infra-Red, and visible light. Of further note is the difference in orbit of the two telescopes. While Hubble travels in a low-earth, geocentric orbit, the James Webb Space Telescope will be situated near Lagrange 2 relative to the Sun and Earth. This means that it will be in a reasonably stable orbit with an equal gravitational tug from both Earth and the Sun. This will put the James Webb much further from the Earth and other radiometric influences and will allow it to peer deep into space away from the Sun and Earth. The launch is scheduled for October 2018 and researchers anticipate five to ten years of functionality. The launch mass is sizable (6,500 kg) and the 18 facets of the mirror must be folded for launch and deployed in space. There is much that could go wrong in such a complex system and so we pray for a safe and efficient launch of the James Webb Space Telescope. Hubble: 2.4 metre mirror; 4.5 m2 collecting area; four main instruments observe in the near ultraviolet, visible, and near infrared spectra; When finally launched in 1990, Hubble's main mirror was found to have been ground incorrectly, compromising the telescope's capabilities. The optics were corrected to their intended quality by a servicing mission in 1993. NASA.gov, NASA Website, “James Webb Space Telescope,” http://jwst.nasa.gov/public.html, viewed 2016-07-22. Wikipedia, “James Webb Space Telescope,” https://en.wikipedia.org/wiki/James_Webb_Space_Telescope, viewed 2016-07-22. Wikipedia, “Lagrangian Point,” https://en.wikipedia.org/wiki/Lagrangian_point, viewed 2016-07-22. The wonders of God’s creation will never cease to amaze me. On three different occasions in two geographically distinct areas I have witnessed Red-winged Blackbirds riding on the backs of hawks. You have likely seen the phenomenon where smaller blackbirds are seen harassing larger hawks. Red-winged Blackbirds can be quite territorial and will work to protect their nests. Hawks, being carnivorous, are not opposed to eating smaller birds and particularly, young ones in the nest. The blackbirds will chase hawks away from their nesting area by flying at the large bird from above, thus avoiding the lethal talons and beak. They will peck at the hawk and generally cause enough disturbance to chase away the large predator. A few of the little blackbirds get quite bold. 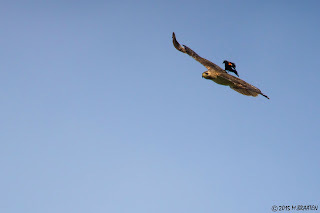 They will actually land on the back of the large hawk and peck at his neck while riding at a position just in front of the hawk’s wings. It is the equivalent of an avian rodeo. The hawk will begin to fly more erratically in hopes of shaking the tiny bird off of her back but the blackbird can hang on for quite a while. It is also slightly reminiscent of scenes in the movie Avatar, where the residents of Pandora manage to ride on the backs of large winged beasts. How did this behaviour develop? Did one little bird do this by accident and then realize he could impress his friends? “Watch this fellas! I'm gonna ride a killer!” Did the behaviour get passed around blackbird circles when they all went to their wintering grounds in California? Watch for this behaviour the next time you are out in a marshy area with lots of blackbirds and hawks. You might just be rewarded by a glimpse of this comical looking performance. At a time when racism, violence, and suffering seem to be greater than ever, these words of Fyodor Dostoyevsky are very appropriate. “. . . spiritual matters are very hard to explain. . . . I am convinced that those who refuse to believe that God can do far more than this, and that He is pleased now, as in the past, to communicate Himself to His creatures, shut fast their hearts against receiving such favours themselves. Do not imitate them, sisters: be convinced that it is possible for God to perform still greater wonders. Do not concern yourselves as to whether those who receive these graces are good or wicked; as I said, He knows best and it is no business of yours: you should serve Him with a single heart and with humility, and should praise Him for His works and wonders. The Interior Castle by Teresa of Avila is a classic of spiritual literature. Teresa is a humble and devout follower of Jesus who experienced a great many spiritual manifestations. She saw miracles, experienced communication from God, and had physical experiences that both comforted her and caused her to repent of sin. Yet, she always found it difficult to explain her spiritual experiences to others and often repeated the sentiment that “spiritual matters are very hard to explain.” I would concur with this idea. The way that God communicates with each of us can be very unique and difficult to explain to someone else who may be wired quite differently from ourselves. Some of my own most intimate moments with God have left me overwhelmed and encouraged by His presence but when I try to explain them to even my closest friend (my wife), I am left speechless. When I share my journal writings with her she must sometimes wonder if I am having a schizophrenic break. Yet, Teresa of Avila continues to encourage us to trust that God can do far more than one typically sees in the world and to never “shut fast our hearts against receiving such favours” ourselves. She says, “be convinced that it is possible for God to perform still greater wonders.” What wonders might we be missing because we have shut the door to miracles and manifestations of our God? How might He communicate with us if we truly opened ourselves to His presence? Yet Teresa is also quick to direct us away from putting too much emphasis on the miracles of God. She reminds us that we are not to focus upon miracles nor only seek the spectacular in our relationship with Jesus. She says that we should simply, “serve Him with a single heart and with humility, and . 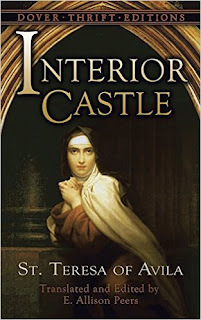 . . praise Him for His works and wonders.” This too is good advice and I highly recommend reading The Interior Castle for a greater explanation of these matters.